Okay, I have had this mild obsession for some time about setting the longest recorded Duenna flight. Back in 2008, Buzzbee from AVSIM recorded a 6955nm / 22:27 hr flight in a 747-400. I believe this is the longest standing flight (at least publically noted on the FS-Duenna site). Three days ago I took off from Perth, Western Australia (YPPH) in a fully laden B-36H in an attempt to best Buzzbee's record. Several hours into the flight, our cat stepped on the power switch and the computer promptly went dark. Argh! So yesterday I took off from YPPH again in the B-36H and this time was successful in setting the time/distance record (I think). I rolled from Perth at 3:16pm CST (local time here in TX) and landed safely the next day in Las Vegas (KLAS) at 6:57pm CST for a total of 27:41 hrs and 8374nm covered. I could have pushed it another 1200nm or so but wanted to go ahead and land before I lost power or some other mishap occured. Convair's Big Stick climbing out of Perth. Of Note: It took me about 1:20 / 220nm to reach cruising altitude of 32,000'. My computer lost wifi several times during the flight which seemed to mess up the recorded Duenna timing in the summary section unfortunately (got the communication error). The distance is shown along with a funky map graphic of the route (which actually was Perth-Townsville-Hawaii-Las Vegas). Who else is game for a long distance non-stop effort? Last edited by Moses03; February 26th, 2019 at 06:10. Hey Kevin, hot dog that is a long run. Here hoping that you got the title as the long run. I decided to take up Moses challenge. I knew I could not keep aloft as long as the B36 but thought I could better the distance. I scouted winds aloft using Skyvector to select my routing to take advantage of best jet stream winds. I am pretty happy with the results. 23hours 49 minutes aloft, 13,128nm. The duenna site stopped tracking when I crossed the Greenwich Meridian but Duenna on my computer kept on running. I did not have crash detection on so I got a yellow border (possible violation) but it was a clean flight. Wow! 13,128nm is going to be tough to beat. Nice run Jeff. Edit: Failed. FSX, Duenna and FSXWX stopped communicating with each other through FSUIPC after around 8 hours. Last edited by Spookster67; March 16th, 2019 at 10:29. OK, so a single leg of over 13,000 nm looks like the goal. As noted, there may be problems with some setups holding the pieces together for extended hours but that's also the history of aviation. Is max distance, or max time the target? Rob- My thinking is max distance is the key. Time aloft without refueling is a goal but you could circle the field for 30 hrs so not much adventure in that. If the time aloft is record setting along with your straight line distance attempt, then all is good. I have a cat problem - the top of my tower PC is warm and a favourite spot! I've had to make a cover flap for the power and reset buttons on the tower (which are also in the top surface), to avoid any cat catastrophe. Success, at last. 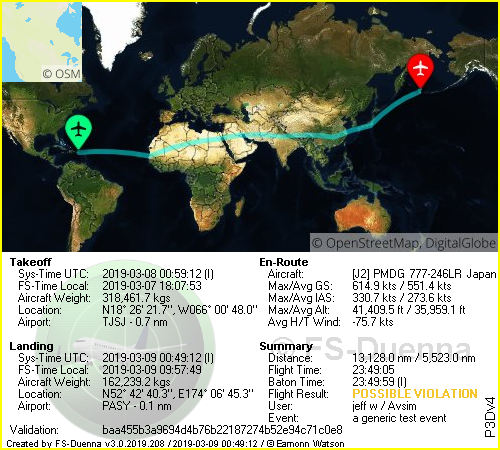 Using FSrealWx Pro caused no issues for my PC or FSX, so I've just landed a 24 hours 37 minutes flight, from Dubai to Halifax, the long way round (14,068nm). It was the Project OpenSky B777-200LR. Brilliant effort. The gauntlet has been thrown down! I took the B777-200LR out for another long trip at the weekend. This time I followed the jet stream a bit more closely, and although I never got super-strong tailwinds, it was always reasonably good all the way. I pushed the fuel range a bit further too - almost too far, as I ended up with only 163lbs at the end! Just over 27 hours, and 15,113nm on the Duenna. Making it more challenging. I hope the passengers had decent food and some good movies. The 15,000nm barrier has been breached!